Plantain, or Plantago majus, is one of the many plant gifts from the Garden that I am continually humbled, and intrigued, by. It was there for me this past summer when Carra and I were harvesting white peaches, the tree so heavy with juicy fruit that the birds had started to peck at a few, which in turn attracted the bees, yellow jackets, even wasps. Determined to save what we could of the quickly ripening harvest one afternoon, I hastily entered the open-centered tree without gloves on, and without considering consequences, clearly, and started harvesting away. It did not take much time before I was stung by one of our pollinator friends, on the soft, sensitive skin that connects my thumb and index finger. The sting, startling and enlivening at the same time, saw me respond instinctively: running toward the Sweet Corn and Cosmos bed where I had spied some plantain growing at some point, pulling some leaves from a bright green, broad-leafed plantain plant, and quickly shoving them into my mouth where my teeth worked quickly. I was able to spit a green poultice out onto my skin within 45 seconds of being stung and the stinging sensation and immediate swelling were all but gone from my hand in another 45 seconds. Such gentle, quick, and thorough relief I could not have imagined from one of the medicines or treatments available in our more formal First Aid Kit in the office. Burn and sting creams sealed nicely in small foil packets and bandages rolled tightly in their cardboard boxes do, indeed, have their place on our farm. But in the Garden, when we are present to them and ask their permission, we are blessed to be surrounded by plants and forces that heal. 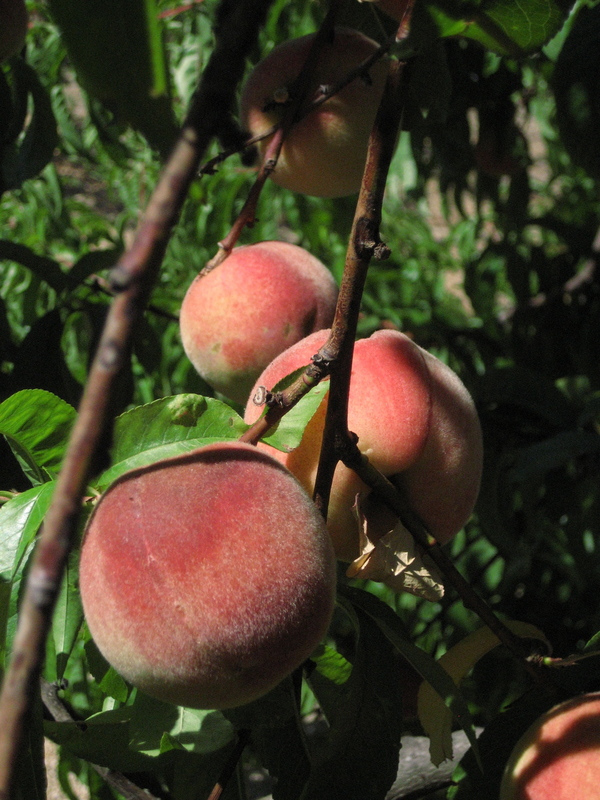 Our peach crop was gorgeous and heavy and needed harvesting -- like all things do in the beautiful height, and heat, of summer. As grateful as I am for our fruits, and the heat they take in and transform into juice and nectar, so too am I indebted to the oft-overlooked, always steady, cool, and ready-to-provide "weeds" that we never actively cultivate yet always find. Plantain was considered magical in pre-Christian times. It more or less followed European settlers around the world, known by Native Americans as "white man's footprint," as it sprung up around wherever white men seemed to travel on this continent. It is used to quell itches and rashes, from poison oak to diaper rash, and relieve stings, traumatic bruises, even burns and cuts. Its leaves can be combined with elderflower and mint as a tea used to treat hayfever and other allergies, as it has a wonderful antihistamine effect. For these reasons, and because it is a great purifier, too, plantain taken internally provides a soothing effect on the mucous membranes of the digestive tract, relieving stomach ulcers and symptoms of I.B.S. New to me, is that Plantago majus is actually related to Plantago ovata, what we commonly know, and see sold in stores, as psyllium. Plantain's seeds can be eaten raw or cooked: they are a rich source of vitamin B1. The seed husks swell up and are very absorbent -- wonderfully full of dietary fiber -- and ALL wild seeds are rich in Omega 3 Fatty Acids. So, look around, celebrate what you cultivate as our big Harvest holiday approaches, by all means. But do not forget about the other gifts, the plain and ubiquitous ones, that we are surrounded by throughout the whole year. We will strip these dried seed stalks of both their seed and husks and enjoy them in smoothies, baked goods, cereal, etc. They are full of fiber and Omega 3's.